Painting Under The Stars – Holiday Edition! drinking, dining and creating at The Loma Club! Christmas has never looked so scary. 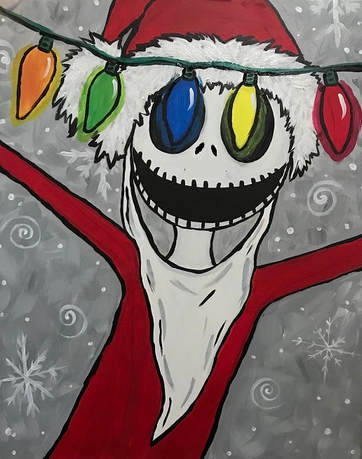 Nightmare Before Christmas Fans will love creating this work of art, inspired by Jack Skellington as Sandy Claws. Participation available for children ages 13+ and adults. Limited seats for this workshop. Sign-up early to save a spot! Arrive early to save a seat, with painting to begin promptly at 7pm. Recommended for teens and adults only at this venue. Beginners and artists of all skill level are welcome! Tickets are non-refundable and event is rain or shine. We will be painting outside on the heated patio (weather permitting). Please dress accordingly. If rain, event will be moved indoors. A 2.5 hour painting lesson to create your own version of our “Nightmare Jack Skelleton” work of arton 16X20 canvas. Gently guided instruction, and all art materials provided.